Looking for best twitter unfollow tool to remove peoples who aren’t following you on twitter? We all are thought to connect and interact with the peoples on social media to boost engagement and gain more followers. But in most of the cases, when we follow someone, they won’t follow us back and having a lot of people who don’t follow us is not a good sign indeed. In my early days on Twitter, I was so dumb that even I don’t know how can I use Twitter to promote my blog post and can get massive traffic. I blindly follow peoples on Twitter, without knowing if they’re following me back or not. But today, Twitter plays a vital role in growing my blog engagement. So, if you also suffer from the same problem where you follow peoples on twitter but they won’t follow you back, Then this guide can help you a lot in unfollowing the peoples who aren’t following you back on Twitter. So if you’re tired of manually unfollowing peoples on Twitter, then here I’m sharing top 6 best twitter unfollow tool which helps you to mass unfollow peoples who aren’t following you on Twitter. Why Should You Unfollow Peoples on Twitter? Unfollowing the peoples who aren’t following on Twitter is one of the necessary steps you need to follow when you’re on it for a long-term goal or purpose. Unfollowing peoples who don’t follow back you on Twitter can give more chances to connect with the right influencers and help to boost your blog engagement and gain more followers. Unfollowing the peoples who aren’t sharing the common goal will make you have more time to gather others who have enough opportunities for you. Unfollowing the peoples who are from different niches will give you a chance to follow some more peoples who have a similar interest as you. I guess, now you completely understood the importance of unfollowing the peoples who aren’t following you back on the twitter! Unfollowing them manually on Twitter consumes more time and efforts, but you can use various automated tools to mass unfollow them on Twitter. So let’s continue to the top 6 best tools which help you in unfollowing the peoples on Twitter. SocialBee is one of the widely popular social media management tools. This tool is mostly used by professionals to manage their social media accounts and Twitter accounts. You can use this tool to follow and unfollow peoples in bulk. You can also use this tool to follow the mutual followers of peoples using their username. This tool also helps you in scheduling your post on all social media accounts, grow followers and schedule messages for new followers. Furthermore, it also helps you to follow the audience of your competitors. Schedule Posting: This tool will help you to schedule your posts on all social media platforms including group and page post scheduling. 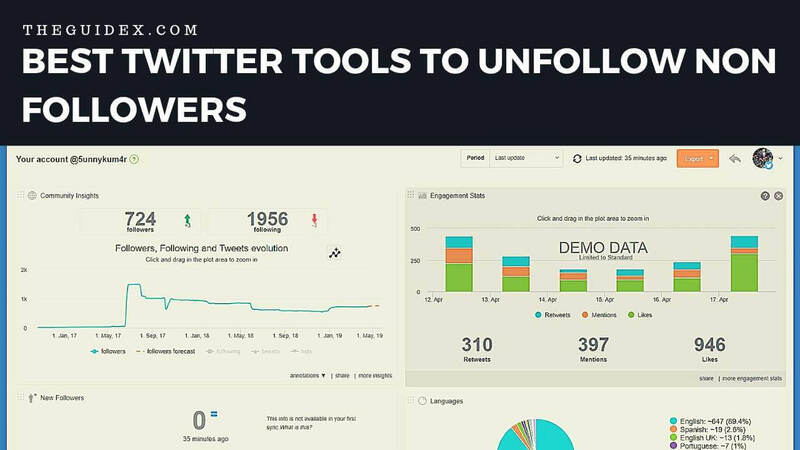 Mass Twitter Unfollow: This tool will help you to unfollow peoples in bulk. You can use this tool to unfollow non-followers quickly. Keyword Search: This tool also lets you follow influencers by Keywords. Enter any related terms, and it will show the relevant followers according to the searched keyword. Audiense Connect is another most popular Twitter marketing platform. You can also use this tool to track your followers and non-followers and easily unfollow the non-followers. You can use this tool to easily unfollow the non-followers and it also provides Twitter analytics in graphical representation. This tool is available in both a free and paid version. You can try the free forever plan of this tool to easily unfollow the non-followers from your list. Account Cleanup: This tool will help you to clean up your Twitter account and remove non-followers and fake twitter accounts. Freemium Option: The Circleboom app comes with the both free and paid version. If you don’t have enough budget to buy the premium plans, then you can continue using their forever free plan. Crowdfire is another popular social media management tool which is available on a freemium basis. You can use this tool to mass unfollow your twitter non-followers with ease. In the free plan of Crowdfire, you can only add a single account of Facebook, Twitter, Instagram, and LinkedIn. Besides it, you will get an option to add more than one profile of each social media account on their paid plans starting from just $7.48/month. Freemium Option: The Crowdfire app comes with the both free and paid version. If you don’t have enough budget to buy the premium plans, then you can continue using their free plan. Circleboom is another best Social Media Management tool, which is available in both a free and paid version. You can use this tool to unfollow peoples in your network, to schedule posting, and for account analytics. The free plan of Circleboom can include follow-unfollow tool, schedule posting and you can manage one profile with them and in the paid plan of Circleboom, you get an option to manage upto 50 profiles with fake protection, smart hashtag and more options. The circleboom uses a responsive mobile friendly design too, so it makes follow and unfollow tasks easier and fun on mobile devices. And if you compare circleboom with other twitter unfollow tools, it offers the ultimate best price. ManageFlitter is another awesome tool which you can use to clean up your Twitter account. Starting with just $12/month, this tool is ideal for small and big businesses to clean up their Twitter account and it also provides a detailed analytics report. If you’re having a small business, then the starter plan of $12/month is perfect for you. It helps you to grow your account and also helps in unfollowing the non-followers. The new beta version of ManageFliiter can help you to remove mass non-followers in bulk and it can also help to find the fake Twitter followers and the most active Twitter followers! In general, this tool is perfect to manage your Twitter account and helps to grow. Mass Twitter Unfollow: You can use this tool to unfollow the non-followers in bulk in just a single click and save time. Identify Fake and Active Followers: You can use this tool to find out the most active followers and also you can get the fake Twitter accounts using this tool. Tweepi is yet another popular SMM tool which you can use to cleanup your Twitter profile and remove the non-followers from your Twitter account. Tweepi has helped thousands of peoples to follow and unfollow tons of peoples on Twitter. You can also try this tool to remove non-followers from your Twitter account. This tool is the most powerful yet simple to use. Unlike ManageFlitter which offer single click mass unfollow, you can unfollow people one by one using Tweepi. Clean Interface: Tweepi offers clean and easy to use interface through which you can easily unfollow the non-followers. iUnfollow is another most popular freemium tool which you can use to unfollow non-followers. With the help of this tool, you can easily follow and unfollow peoples in bulk. The iUnfollow tool offer 50 follow back and 50 unfollow in their free plan along with 25 free follow back request but on the paid plan of iUnfollow, you can remove these limitations. The iUnfollow is running an exclusive offer on their website through which you can remove the limits and upgrade to their pro plans at just $9.99/year (normally $36.96/year). I think this is one of the best deal you can ever get on Twitter Unfollow Tool. Grab Now! I think unfollowing the non-followers is not a bad thing on Twitter. To gain more active twitter followers and to boost the engagement you should have to clean up your Twitter account. It should be a good idea to use twitter unfollow tools to easily unfollow the mass non-followers on Twitter to save time and to keep the Twitter Interface Clean. Looking for best twitter unfollow tool to remove peoples who aren't following you on twitter? Here In this guide, we're sharing the top 6 best tools which you can use to remove the non-followers from your Twitter and clean up the Twitter interface. These tools will also help you to grow your Twitter account and to find fake and active Twitter accounts. Furthermore, you can also use these tools to schedule the posting on your social media accounts.